As I saw this composition in the viewfinder, it reminded me of a person wearing sunglasses attempting to look cool. 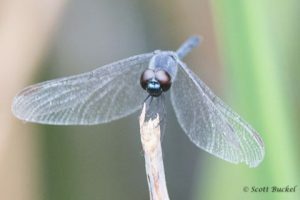 This is a Seaside Dragonlet that I photographed at San Bernard National Wildlife Refuge about a week or so ago. This entry was posted in Insects, Wildlife by Scott Buckel. Bookmark the permalink.